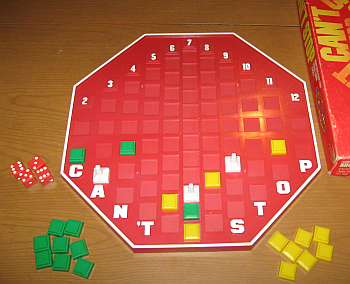 Can’t Stop is a fascinating game, and I love the push-your-luck mechanism. But I tried playing this game with my family and they didn’t care for it. I’m not sure why. Maybe it was too abstract to be engaging, maybe calling the probabilities required skill they didn’t feel like developing. If you’ve ever played Chronology (http://boardgamegeek.com/boardgame/834/chronology), adding a push-your-luck rule adds a new dimension to a great game. The rule is this: if you successfully add a card to your timeline, you can request another and try again on the same turn. You can keep doing this as long as you like, but if you miss any of the cards, you lose ALL the cards you gained this turn. This speeds the start of the game up, and also means that no matter now close you are to winning, another player who is desperate enough can try to pass you for the win.